it was too time consuming to scroll up and down the document in MS Word, which was a continual necessity. it left a lot of formatting to be done at the end. Both of these problems are solved by Writing Outliner. Writing Outliner also puts all of MS Word’s writing and formatting tools at my disposal, which is a big bonus. So to conclude, if you often write long Word documents, give Writing Outliner Word Add-in a try and you pain will go away. I have just integrated UserVoice voting system with the Writing Outliner website, and I have “migrated” some existing suggestions from the existing Writing Outliner forum, please vote now to influence the future development of Writing Outliner – the MS Word add-on for professional and creative writers who need to write long texts (novels, technical manuals, research papers, etc) in Microsoft Word. Click here to vote on new features for Writing Outliner now! I’d like to let you know that I have just made use of you promotion and bought both Writing Outliner and MindVisualiser licenses. Although I was rather ‘silent’ last months, I followed the forum and your announcements with still growing satisfaction and respect – I have never seen such a successful software development from the scratch and fruitful interaction between testers/fans and the developer. My sincere congratulations! Good job Edwin!! Sorry not being modest by showing off this email, but what I want is to show you that I really listen to you users and I ask for your help to vote on the feature suggestions made in the past few months with this new voting system. Outliners – the left Project Manager Outliner and the Multi-column Outliner. Document icons (status and label). Project compilation (merging all documents in a project into a single document for output). All these features (still growing) that are added to Microsoft Word by Writing Outliner Add-on makes MS Word into a perfect software tool for writing novels. What novel writing software do you use? 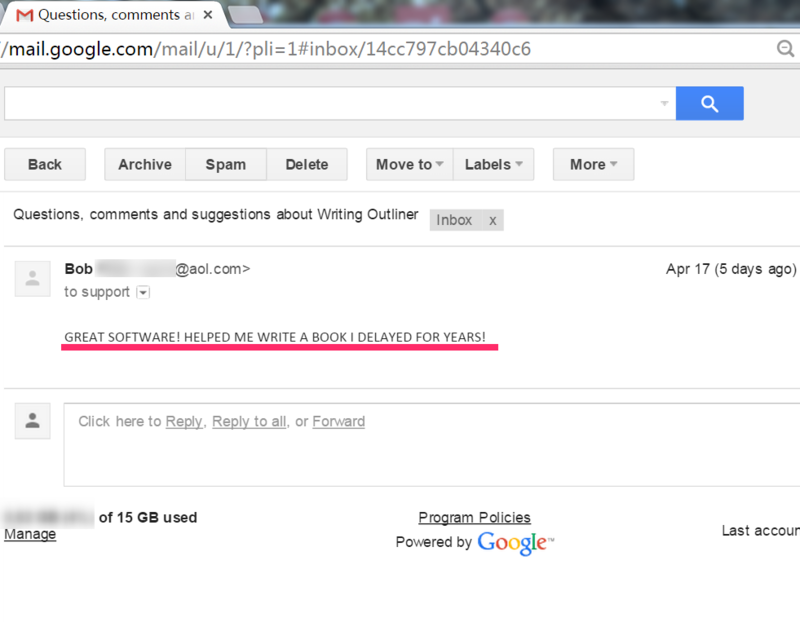 The Writing Outliner Word™ addin is intended to be a general book writing software for writing various kinds of books, these should include technical book/manual, novel, non-fiction, and so on, so I wonder what novel writing software are you using currently and what problems are you facing in using that software?